High Water Mark Photo Scavenger Hunt: Be Flood Aware! Enter for a chance to win prizes! Flooding is the most frequent, costly, and damaging disaster experienced by the State of Vermont and the Central Vermont Region. From the Flood of 1927 to Tropical Storm Irene in 2011, flooding has consistently been a threat to property, public infrastructure, and human life. The recent National Climate Assessment released by The White House predicts that flooding will only become more common in the Northeast. For these reasons and many more, CVRPC will be including an extensive Flood Resilience component in Plan Central Vermont. To kick-off this effort, we’re launching our High Water Mark Photo Scavenger Hunt! If you are posting the photo to our Facebook wall or e-mailing it to us, please include a brief description of the high water mark’s location. Each person who submits a photo by June 30 will be entered into a random drawing to win one of two prizes: a $50 gift certificate to the Central Vermont restaurant of their choice or a season’s family pass to Wrightsville Beach! Two winners will be selected. Just one of the many high water marks in Central Vermont! FEMA Region 1 is conducting a conference call on Wednesday, May 21 at 2 PM to provide information regarding the Pre-Disaster Mitigation (PDM) and Flood Mitigation Assistance (FMA) grant programs, which provide municipalities with additional mitigation funding opportunities beyond the Hazard Mitigation Grant Program (HMGP). Subapplicants may apply for a maximum of 5% of the total funds requested in their application to cover management costs (indirect costs). PDM and FMA applications are due to the Division of Emergency Management and Homeland Security (DEHMS) by June 30 and must be submitted via the online e-Grants portal. Contact Ray Doherty (ray.doherty@state.vt.us) or Misha Bailey (misha.bailey@state.vt.us) with questions or concerns, or to get an e-Grants username and password. Instructions: Dial the call in number listed below and follow the voice prompts. When asked, enter the conference code/PIN followed by the # key. CVRPC staff members Stephanie, Dan, and Amelia, attended the second annual U32 High School Green Fest, which was held on May 15. Sponsored by faculty member Michael Horowitz and a dedicated group of environmentally minded students (the “Green Team”), the Green Fest is a chance for students, faculty, and staff to celebrate all that they do to lessen the school’s impact on the environment and learn about the similar efforts of businesses and organizations in the community. A variety of different community members tabled in the school’s atrium and held workshops throughout the day. Dan took a group of over 20 students to the disc golf course to teach them about Geographic Positioning Systems (GPS). Some students even had the opportunity to try plotting points on the hand-held GPS that could aid in future mapping. 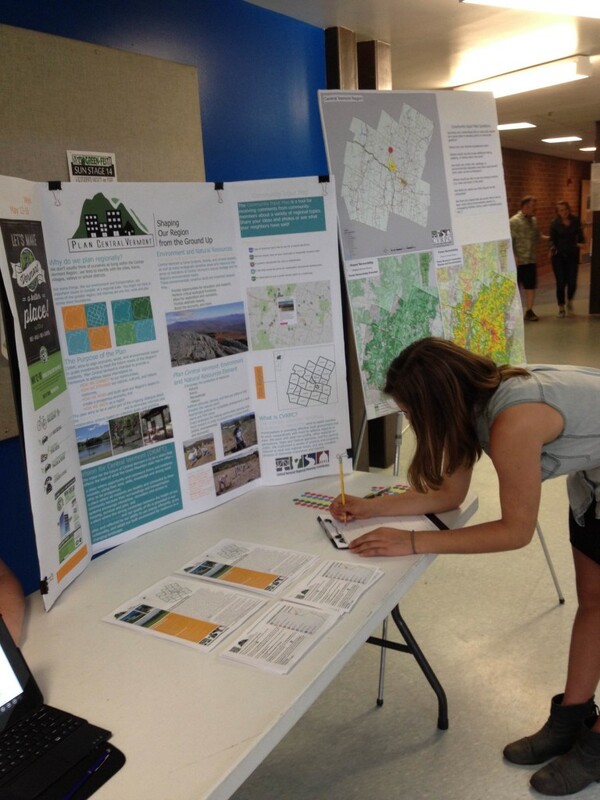 In the atrium, Stephanie and Amelia had a table set up, including a poster explaining what CVRPC does, why we plan regionally, the purpose of Plan Central Vermont, and some potential topics for the Environment and Natural Resources Element of the Plan. Staff also promoted Way to Go! Week and had the interactive Community Input Map on display. Students were able to place stickers as markers and make comments on a large print out map of the Region. General comments included requests for a larger network of bike paths, more public transportation options, and increased park and garden space in the Central Vermont Region. The specific comments that were made have been uploaded to the Community Input Map. 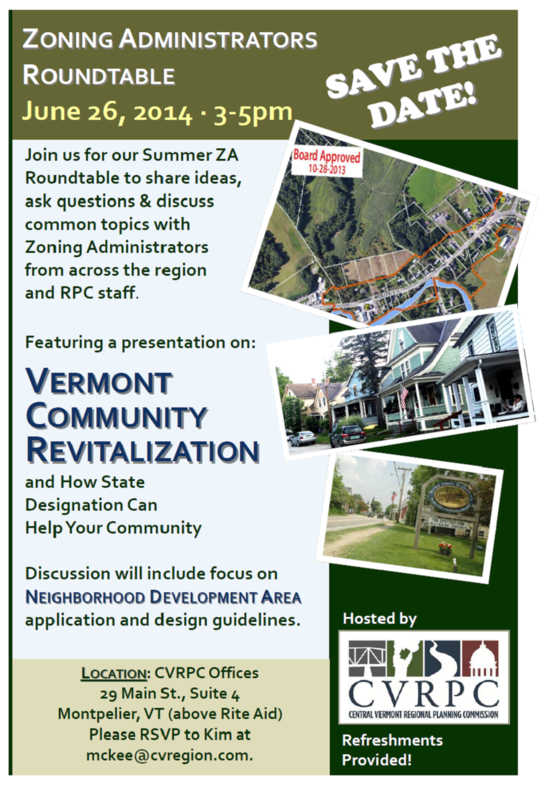 CVRPC staff distributed Plan Central Vermont brochures and Community Input Map how-to sheets, in hopes that more Green Fest attendees will use the interactive feature on our website to provide additional comments and continue to participate in the planning process. To view the comments from yesterday’s Green Fest and add your own, please click here. Front Porch Forum now available in all Vermont towns! Hi. Front Porch Forum offers an easy way for neighbors to connect…and now it’s available in every Vermont town. It’s free. It’s local. And it’s friendly. Check it out at http://frontporchforum.com/. More than 75,000 households across Vermont already use their local FPFs to find roofers, loan ladders, warn about break-ins, sell cars, rally volunteers for pie suppers, draw crowds to farmers’ markets, and share bear and moose sightings. Common topics also include road conditions, lost pets, public meetings, and a wide variety of local events. And in times of need, such as during natural disasters, your local FPF becomes especially powerful. My wife and I started Front Porch Forum in 2006 in our Burlington neighborhood. It expanded steadily, and now we’re happy to announce that local forums are available in every Vermont town. We’re excited to bring FPF to every corner of the state, but we can’t reach everyone to tell them. Please help spread the word by forwarding this message to your Vermont friends, colleagues, and family. People typically need to hear about FPF several times before they successfully register, so don’t be shy! Send them to: http://frontporchforum.com/. Also, your FPF will be more useful and robust when many people submit postings. So please add your two cents to your local FPF. Just sign up, log in, and click Submit Posting. The Vermont Open Studio Weekend, hosted by the Vermont Crafts Council, will be held May 24-25 from 10 AM – 5 PM. The weekend is a statewide celebration of art and creativity that gives visitors the opportunity to meet a diverse group of artists, view a variety of different studios, and catch a glimpse of the creative process. The tour features a wide range of artists, including sculptors, weavers, painters, and many more. This year, the Vermont Department of Tourism has launched a campaign to benefit the Vermont Crafts Council and the Green Mountain and Mad River Byways, scenic roads that run throughout the Central Vermont Region. They have created special Google maps for the event, which show the artists and craftspeople who will be open for visitors throughout the weekend along the Byways. For more information about Vermont Open Studio Weekend, click here.